This chicken spaghetti is made with stewed tomatoes and tomatoes with green chile peppers, along with condensed soups and cheese. 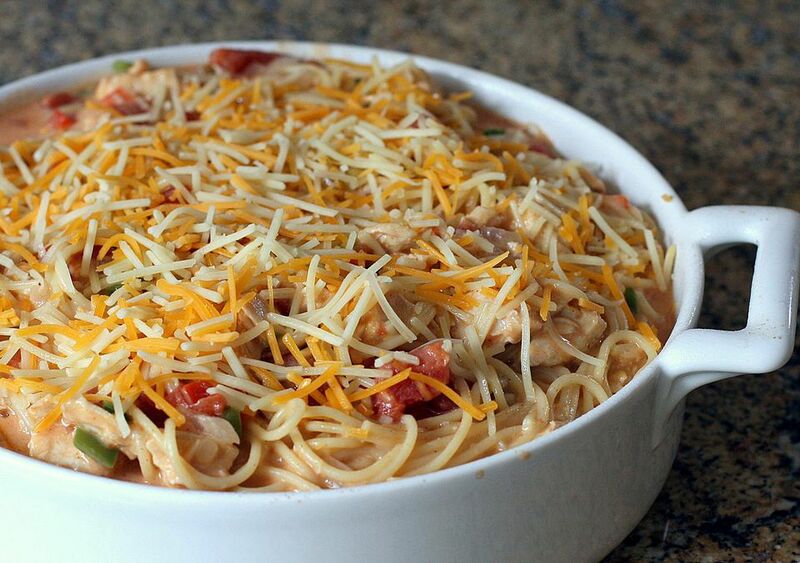 It's a basic chicken spaghetti recipe, and it makes a big batch. Cook spaghetti in the reserved broth. Saute the bell pepper and onion in a large skillet until vegetables are softened. Add soups, Ro-Tel, and stewed tomatoes. Cook over low heat until bubbling, then stir in the diced chicken and spaghetti. If the skillet is not oven safe, transfer spaghetti to a lightly greased baking dish. Top with cheddar cheese and bake at 350° F (180° C/Gas Mark 4) for 20 to 30 minutes.